In a new segment to Around the OHL this season, I’ll take a weekly look at 12 things peeking my interest in the world of junior hockey. It might be OHL related, sometimes it might not. Sarnia’s Red Hot Start – Sarnia’s offence has been sizzling to start the season, averaging more than five goals per game. Their defence was suppose to be their weakness but steady play and strong goaltending has the Sting also tied for the fewest goals allowed. A top end blueliner would certainly help solidify them as one of the CHL’s best. Raaymakers to London – Enough is enough in London, after the teams’ first eight game losing streak since the 1995-96 season (yes, THAT season they won only three games) they went and acquired veteran goalie Joseph Raaymakers from the Greyhounds. Although he’ll be a welcomed addition to the crease, he wont be able to help London improve on offence, which has scored a league low 18 times. This will help steady the ship, but the big guys still need to score if they want to turn their season around. Mississauga – Similar to London, the Steelheads were expected to be a contender this season, both Owen Tippett and Michael McLeod remain in the NHL, but surely they have the pieces in place to win more than once in their first eight games, right? 67’s need to keep the puck out – Ottawa is one of the younger teams in the league, with nine players born in 2000. The team has allowed a league high 54 goals against, although 11 of those came in the season opener against Barrie. Remarkable that a team with a goal differential of -18 still has a 6-4-1-0 record. Well, if you take Ottawa’s three blow out losses (11-2 to Barrie, 7-2 to Sarnia and 7-1 to Sudbury) then they actually have a positive goal differential. I guess that explains that. Hamilton – The Bulldogs have a good record (5-1-1-2) despite just 26 goals for in the early going. Thankfully they’ve been able to keep the puck out, with just 26 goals against. That’s helped by and older blueline with three 1997’s (Templeton has been playing some forward) and two 1998’s. Will Bitten has been their most consistent scorer with points in eight straight games. 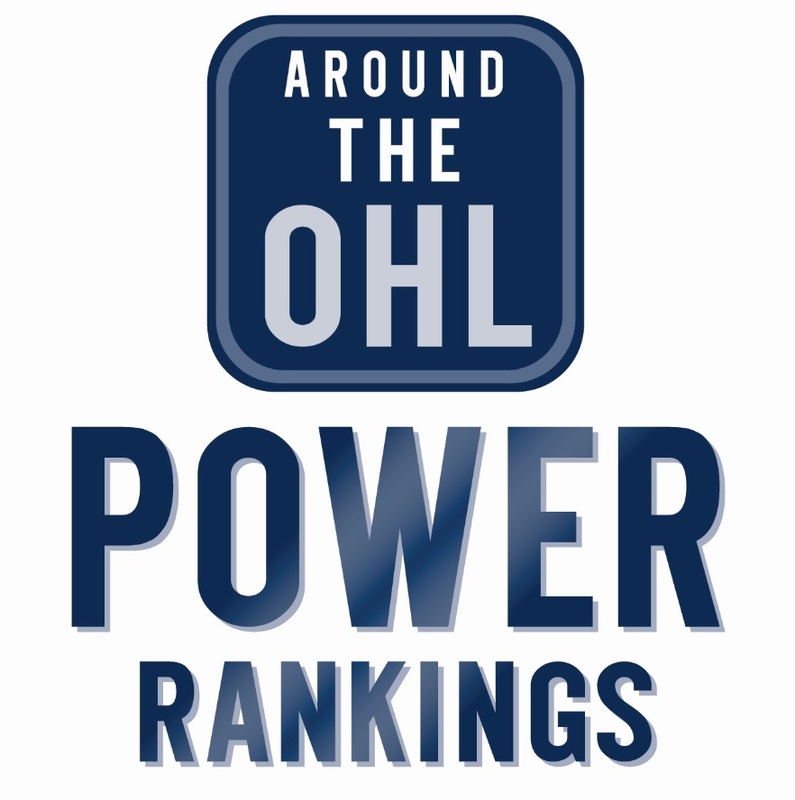 Sean Durzi – The Owen Sound blueliner leads the league in assists, and is one point back of teammate Nick Suzuki for the OHL lead in points. He’s on pace for over a 100 points, something that’s only been accomplish by four defenceman in league history. Not bad for a 12th round pick in the OHL who’s been passed over in two NHL drafts. DiPietro and Windsor – It’s no secret that Michael DiPietro has been a big reason, if not THE reason for Windsor’s 6-3-1 start. After hosting the Memorial Cup last year, Windsor was expected to be one of the bottom teams in the West, but DiPietro has the Spits’ off to a good start despite averaging just 2.8 goals a game. Shutouts – There have been just three shutouts in the OHL this season, compared to nine at this point last year. Like most observations in mid-October, it might be too early to look into. Kitchener – The Rangers already have one of the stronger teams in the league, and made a big splash this week with the addition of Kole Sherwood from Flint. The team is looking for their first Midwest Division title since 2007-08, and could be in good shape to do so this season. With Erie and London having an off season compared to their recent standards, Owen Sound will be the team for them to beat in the Midwest. ‘Hounds On The Road – Sault Ste. Marie won a league best 26 games on the road last season, their fourth straight year they’ve won significantly more than they’ve lost away from home. They are looking poised to add a fifth year to that stat as they’ve started the season 4-0-1 on the road. Brady Hinz – A big reason for Sarnia’s early success is their depth up front, they are getting scoring from three different lines right now. Hinz has been a big part of that depth, and was recognized as the most recent OHL player of the week. Despite being a bit undersized (5’8″ and 160lbs), he has nine goals in ten games to start the season. He was left off Central Scouting’s preseason player to watch list for the 2018 NHL draft, I’d expect him to find a way onto that list by midseason. Anthony Dumont-Bouchard – Kitchener acquired the overage goalie from Barrie in September for basically nothing (a 14th rounder) and he’s been one of the league’s top goalies since joining the Rangers. The Quebec native played just over three seasons in the QMJHL before coming to the OHL for his final season of junior. He has a 2.14GAA and .928 sv% to go along with a 6-1 record.